The 'Combo Tester' provides a way of viewing up to eight colours together, and automatically creating complementary ranges of up to eight colours. Simple way of generating twelve complementary colours. Aims to provide a way to comment on individual paragraphs of public reports (starting with 'Digital Britain'). Great stuff (not sure about the way comments are integrated (or not) though). "Functions under the auspices of the World Federation of UN Associations." Great idea. Love the descriptions of chaos levels. Longer-term graphs would be nice. Another online thing for freelance types, this one for accounting. Lots of UK-specific stuff. We stayed here this past week. Lovely little place, great location, sleeps up to five. St Ives was great, if wet, this time of year: quiet, friendly, beautiful and tasty. I'm sure there are similar services but if I don't save this I'll forget which one I signed up with to watch a page. Very flexible plugin that lets you create custom forms which create new WordPress posts with their data. Confusing and ugly UI, but nicely powerful. Xero is the world's easiest accounting system. Flickr and Getty Images, the stock photography giant, are launching a new scheme which enables people to market some of their Flickr photos as stock photography through Getty. I’ve no idea how new it is — the selection of some of my photos as candidates is the first I’ve heard of it — but it’s not launched properly yet (the help says “early next year” which I’m guessing means 2009). There are lots of interesting things about this arrangement: The struggling stock photography industry attempting to make money from sources that threaten it; The co-opting of net-enabled amateur photographers into the established method of monetising photographs; The development of activities people used to do just for fun, as hobbies, into semi-professional pastimes. All that kind of thing. But what immediately struck me was the incompatibility of Creative Commons licenses with the new scheme. If you have a photo accepted for the Flickr/Getty library and it’s CC-licensed it will automatically be changed to “All Rights Reserved”. This is understandable for CC licenses that allow for free commercial use — Getty will struggle to sell a photo that is also free for any use. But it’s a great shame that I can’t have a photo licensed as free to use on a non-commercial basis and have it for sale on Getty. This is a great idea, and it seems very nicely executed so far. But my feedback would be that it’s a shame photos can’t still be licensed as Creative Commons. I’d be happy to take part and allow my photos to be up for sale so long as they can still be used for free on a non-commercial basis, as they are at the moment. I don’t take photos to make money out of them and I’m just pleased whenever anyone wants to use them, whether they pay or not. I realise that for others photography is a full or part-time business and this conflict won’t be an issue for them. But it’s a shame there’s no flexibility — allow a photo to be featured on Getty, purchasable by those who are able to pay for commercial use, but still CC licensed for free use by non-commercial concerns. From my point of view that’s not a conflict. I completely understand why Getty, as a commercial entity, wants to limit the rights to use these images and that’s fair enough — it’s your business. I just thought I’d explain why it’s more important for me to keep my images Creative Commons licensed, rather than put them Getty, and therefore why [I] won’t be taking part. No, doubt Getty aren’t too distraught about my lack of participation, but I thought it worth bringing up. Someone from Getty responded, and I won’t quote them in full given it’s a private group, but the gist was: Non-commercial use is ambiguous and the more exclusive we make the photos, the more we and you can make from them. From Getty’s point of view, the point of view of a company whose purpose is to make as much cash as possible, this is perfectly reasonable. But in terms of the greater good, making the world a better place, this is a shame. I love the CC licenses, a standard way of saying “Sure, I don’t mind if you use this, so long as you credit me and you’re not wealthy” (to verbalise one variant). I’ve had lots of my photos used like this, plus a couple used by companies that paid me to do so. The Flickr-adoring part of me wants the Getty arrangement to be a success. But it also worries that if Getty is successful they will pull many of the most interesting photos from the pool of Creative Commons images. For people who already aim to sell their photography, and who often use “All Rights Reserved” licenses anyway, this is no doubt a good thing — an easy to use method of selling their work. But those of us who take photos and share them on Flickr because we enjoy doing so, because it makes the world a more colourful and interesting place, maybe we should stop before we try to “make AS MUCH MONEY AS PO$$IBLE” and think about who it will benefit. 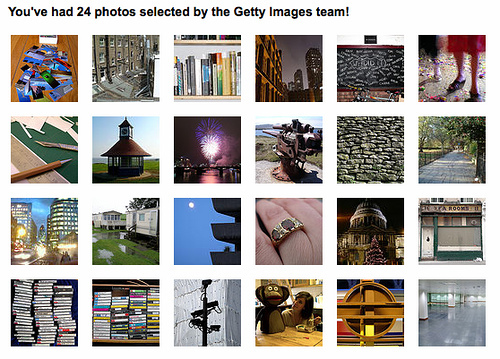 If it will only benefit me and Getty Images at the expense of a more fun and creative world, then it’s not a good deal. Going to talk to those pupils was great fun and this describes how incredibly lucky and clever they are. Very impressive (David and them, not me). Not thrilling, but useful and clearly presented, for UK businesses. Part two of a write-up of a talk Russell gave. Real-world things derived from the internet's good stuff make me excited. I haven't even seen one of these (yet) but it's already one of my favourite objects. I've wanted to do something like this for ages but Russell and Ben actually did it, and did it much better than I'd ever have done it. A trial of a twice-daily very local newspaper in some US locations using content from blogs. It would be difficult to be any worse than, say, Metro, London Lite, Evening Standard, etc. in London. When I'm cycling I get much more annoyed by other cyclists or pedestrians that I do with car drivers. Contrary to expectations there seems a higher percentage of careless idiots in the bike/foot camp than the driving camp. Cyclists, on average, appear much more selfish than drivers, as if they're the only person on the road. When meeting someone for the first time in a while the “So, what are you up to these days?” question soon crops up. Because I’ve been doing an odd mixture of things for the past couple of years friends ask this of me with even less idea than they might otherwise. So, for the subset of people who also read this, here’s what I’m up to these days. The summary is that I’ve mostly been at home, doing things I’ve been meaning to do for ages. I’m a bit unsure about acting right now but still keen on the internet. I need to find more paying work and I’m trying to define what the new challenge is that I need. Since I left the theatre course at LISPA last July I’ve had very little paying work of any description. So I’ve been able to churn through items on the “Things to do someday that I know I’ll never have time for but if I write them here then maybe I can stop thinking about them” list. I’ve digitised VHS tapes, sorted out 3.5” disks, put a lot of unused stuff on eBay, added some new things to the Pepys site, and rewritten the code behind Gyford.com, among other tasks. It’s been great, but I’ve realised there will never be an end to this stuff. There is always more to do. I wasn’t under the illusion that I’d step out of LISPA and end up with paying acting work. Or any acting work come to that. But finding out how to get work has been harder than I expected. It doesn’t help that I don’t feel very enthusiastic. This is partly because as time goes on I feel more distant from that world. And partly because there are some aspects of theatre that I feel like I’ve had enough of, at least for the moment; I don’t want to devise theatre in a group again for a long, long time. And it’s partly because I’m more picky than anyone on the bottom rung of the acting ladder should be. I don’t want to tour the country in a van for no money. I don’t want to appear in dumb adverts (although the money would be nice). I’m not even sure I want to spend ages rehearsing a play unless it’s a fantastic one with brilliant people in a convenient location. Picky, me? I enjoy being on stage and in front of the camera, and I like the difficulty of creating a performance that works. But when I look at colleagues who devote their whole lives to this stuff I feel like I don’t deserve to get anywhere. I’m not sure I want it enough. Not right now, anyway. I haven’t had much internet-related work for the past few months, which I’ve put down to a combination of the financial situation, the fact many people wrongly think I’m now an actor, and me just not trying hard enough. But making websites is what I always come back to. After realising I didn’t know what to do with my masters in Future Studies I returned (happily) to websites. And while sitting in LISPA’s windowless rooms my mind would often wander to things I was doing online, while the converse — distracted by acting stuff while at the computer — never happened. After all these years the Internet still excites me. So I expect to continue making internet things for some time. But I don’t want to return to exactly the same web development I’ve been doing for years as it was getting repetitive — the same scale of sites, the same problems, usually working alone. I’m not sure what direction to take but I want to do something new. New and exciting challenges are needed but I can’t see what shape they will be yet. As a start I’m learning Python and then on to Django — it’s been nine years since I started on PHP and that’s much, much too long only being able to think in one way (with a dash of bad Perl). I don’t want to be solely a web developer — and am pretty sure I have other relevant skills — but for my own projects, at least, I want to be able to make things in different ways. Aside from that first step, I still need to define the shape of the bigger changes. Maybe it’s got nothing to do with the Internet. I don’t know what I want. Despite all that Futures training I’ve always been reluctant at looking to my own future. I have zero idea what I’ll be doing with myself in six months, never mind ten years. Despite the financial mood I feel optimistic about the year ahead. Many friends seem perversely excited, Obama’s arriving to save humankind, I’m getting married in a couple of weeks, and I want to start new things. 2009 sounds promising, if uncertain, so far. To be fair he says it “used to be known as the Corporation of London or the City of London Corporation until very recently when they dropped the Corporation.” Which is true. While it might still legally be known as the City of London Corporation its informal title (used on signs and letterheads etc) has been “known as” simply “City of London” for the last few years. Lots of fun that, thanks Michael!